A half dozen or so of us met on 14th April at Redhall and were delighted to be shown round the garden by a member of staff and by a mental health service user. The whole place was immaculate with raised vegetable beds, polytunnels, espaliered fruit trees, wild life gardens, ponds and a sales table of excellent plants. If you couldn’t come with us, this is a highly recommended garden to go to. It is open 9.00 to 3.30 Monday to Friday and is free but welcomes donations needed to keep up their important work delivering training to 50 people who are recovering from mental health problems. Their next open day will be Sunday 22nd May when they lay on family based activities. We shared a themos of tea/coffee and made some plans for our next visit. We also had the benefit of information about the history of ht garden from Patricia Cook. She is currently researching the history of another property which was owned by the Inglis family and came across details about Redhall and its garden in the course of this. She knew that each of the pillars in the wall used to have an urn on top. Inglis, who built Redhall house, was very keen on the garden and there is information about the plants he bought to stock it. This all added to our enjoyment. 7th May. 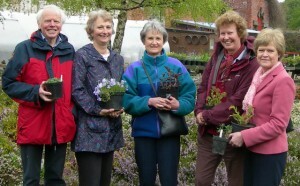 2.00 Grange plant sale at Marchmont St Giles in Kilgraston Road. If you can possibly get along a bit early to help set out the tables then the organizers would be very grateful. Monday 9th may 6.30. Visit to Judith and Tony Reeves’ garden at 125d, Grange Loan just West of Kilgraston. Thursday 2nd June. 2.00 at Shepherd House garden in Inveresk where Anne Fraser or her husband will welcome us. (No tea available.) We may go on to Inveresk Lodge garden over the road afterwards.